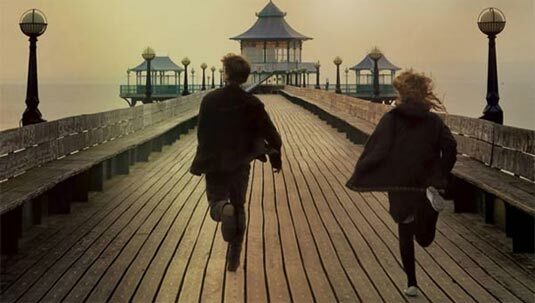 Never Let Me Go, an adaptation of a critically beloved novel by Kazuo Ishigiro (which I have not read) is a film that is easy to admire but hard to like. Set in an alternate present (or recent past, but let's not split hairs) it tells the story of three young people - played in adulthood by Kiera Knightley, Carey Mulligan and Andrew Garfield - who form a love triangle as they try to come to terms with their existence as part of a radical medical program that will save lives but dooms their friendships and loves to a predetermined end. It is difficult to talk about the film in any detail without giving away what exactly it is that will happen to Ruth, Kathy and Tommy - though the film tips its hand at a very early stage when a teacher, played by Sally Hawkins, bluntly informs the impressionable youths (and, by extension, the audience) of the nature of their existence - but I will say it forms a crucial element of both what I liked about the film and what I didn't. Director Mark Romanek, who is a prolific music video director whose only other feature film, One Hour Photo, was a startlingly effective and creepy psychological thriller, gives the film a distant feel that prevents the audience ever really engaging with the characters. This isn't really a problem with the film, since it is in keeping with the dystopian world he is trying to create. We observe these characters with the same cold and clinical detachment that the teachers, doctors and nurses who control their lives do, and the understated way in which Romanek depicts their lives allows the full horror of what is going to happen to them to slowly, inexorably dawn on us. Even the language that characters use to describe what is happening is cruelly antiseptic, designed to calmly mute the awfulness of their fate whilst also acknowledging it. There's something distinctly chilling about the way in which "death" is replaced with the word "completion" in order to make it seem less real to the characters, and in turn make them seem less than human to those who control their fates. What makes it all the more harrowing is that the central characters never really seem to comprehend what is happening to them or try to question whether it is just. There is a crushing inevitability to the story that is at times gutwrenching. Towards the end of the film, two of the characters try to get a deferral so that they can live together, hoping that they can prove to the powers that be that their love for each other is real and that they have souls worth preserving. What gives this plotline much of its power is the knowledge that, even though they are seeking to extend their lives, they still accept their fate. They want to delay it, but they don't for a second think that they can escape it. This all fascinated me. I was impressed by the way in which the film tried to tackle big questions about science and morality, the existence of the soul and the ultimate fragility of all human connections in such a quiet, understated way. I thought that all three actors did great work, with Knightley being a particular standout as the vicious and underhanded Ruth, and the film was technically marvellous, with Romanek's direction being perfectly complemented by Rachel Portman's gorgeous score. But ultimately, and crucially, I did not actually like the film. It was an intriguing and cerebral exercise that never moved me in the way that I hoped it would. The relationships between the characters never felt real, so their quest to live longer did not interest me, so I could not find the resolution as heartbreaking as it is clearly intended. Romanek suceeded in creating a chilly, lonely world, but in doing so he turned me into one of the doctors; interested in what was happening, but detached.